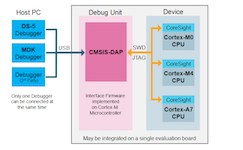 CMSIS-DAP is generally implemented as an on-board interface chip, providing direct USB connection from a development board to a debugger running on a host computer on one side, and over JTAG (Joint Test Action Group) or SWD (Serial Wire Debug) to the target device to access the Coresight DAP on the other. Official reference can be found here. Please install Windows serial driver and check “USB Driver Installation” guide for your board. Freescale Kinetis Freescale Kinetis Microcontrollers is family of multiple hardware- and software-compatible ARM Cortex-M0+, Cortex-M4 and Cortex-M7-based MCU series. Kinetis MCUs offer exceptional low-power performance, scalability and feature integration. Maxim 32 Maxim’s microcontrollers provide low-power, efficient, and secure solutions for challenging embedded applications. Maxim’s processors embed cutting-edge technologies to secure data and intellectual property, proven analog circuitry for real-world applications, and battery-conserving low power operation. Nordic nRF51 The Nordic nRF51 Series is a family of highly flexible, multi-protocol, system-on-chip (SoC) devices for ultra-low power wireless applications. nRF51 Series devices support a range of protocol stacks including Bluetooth Smart (previously called Bluetooth low energy), ANT and proprietary 2.4GHz protocols such as Gazell. Nordic nRF52 The nRF52 Series are built for speed to carry out increasingly complex tasks in the shortest possible time and return to sleep, conserving precious battery power. They have a Cortex-M4F processor and are the most capable Bluetooth Smart SoCs on the market. NXP LPC The NXP LPC is a family of 32-bit microcontroller integrated circuits by NXP Semiconductors. The LPC chips are grouped into related series that are based around the same 32-bit ARM processor core, such as the Cortex-M4F, Cortex-M3, Cortex-M0+, or Cortex-M0. Internally, each microcontroller consists of the processor core, static RAM memory, flash memory, debugging interface, and various peripherals.